Pulled pork with Carolina Root Beer BBQ sauce. Today we had a real southern barbecue dinner. Using the pork left from my Simple Savory Pork dinner, I made some pulled pork. The recipe for the barbecue sauce is contained in a book my daughter gave me, written by a woman of the south, Vicki Prescott. (Sweet Tea ) In it she recounts her memories of growing up in North Carolina and the foods she ate. 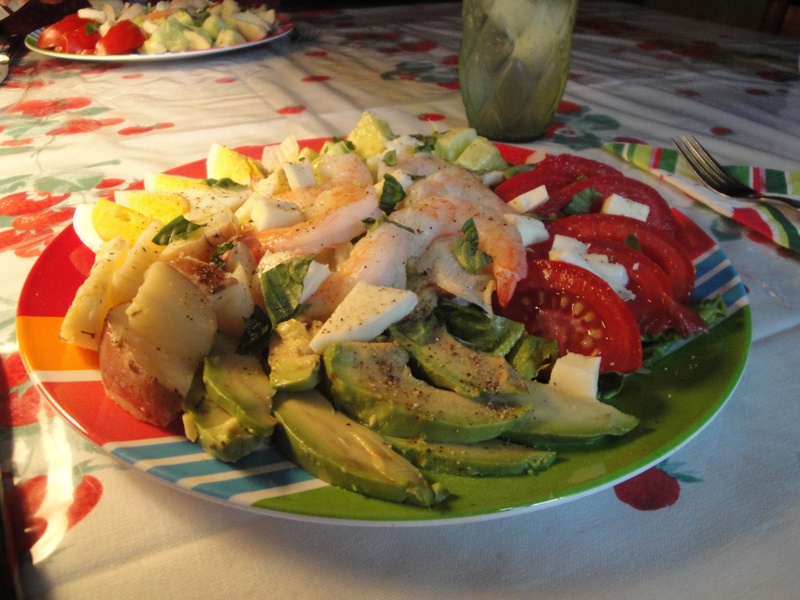 Most meals were prepared by her grandmothers, aunts and mother, so I view them as authentic, family style meals. 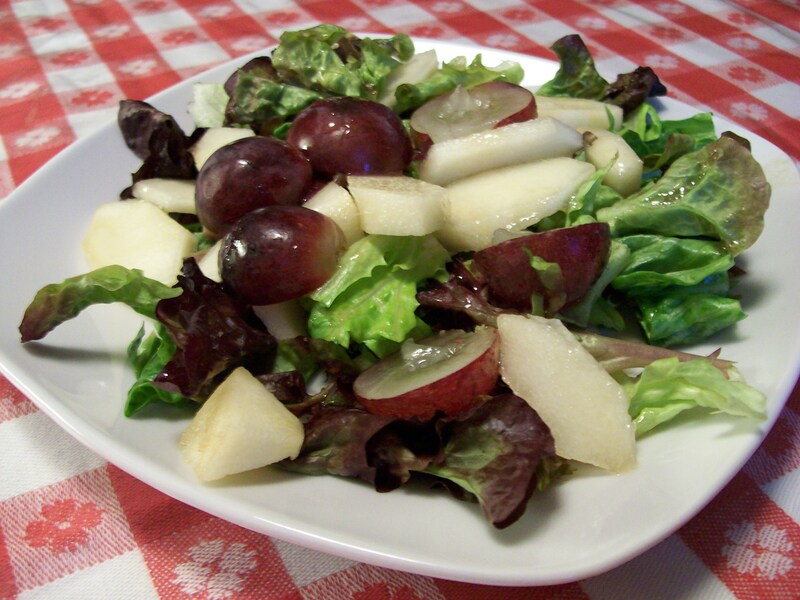 In the book this recipe is called “Carolina CoCola Barbeque Sauce”, but root beer soda can be used with the same delicious results as I have done here. These few ingredients become a luscious BBQ sauce. 1. Melt the butter in a saucepan over low heat. Stir in the onion and cook until translucent. 3. Simmer over medium low heat for at least 30 minutes. 4. Shred cooked pork and add to the sauce. Serve on a bun, or any other way you can think of to enjoy this lusciousness. Bread pudding! An old-fashioned dessert that many of us grew up with. 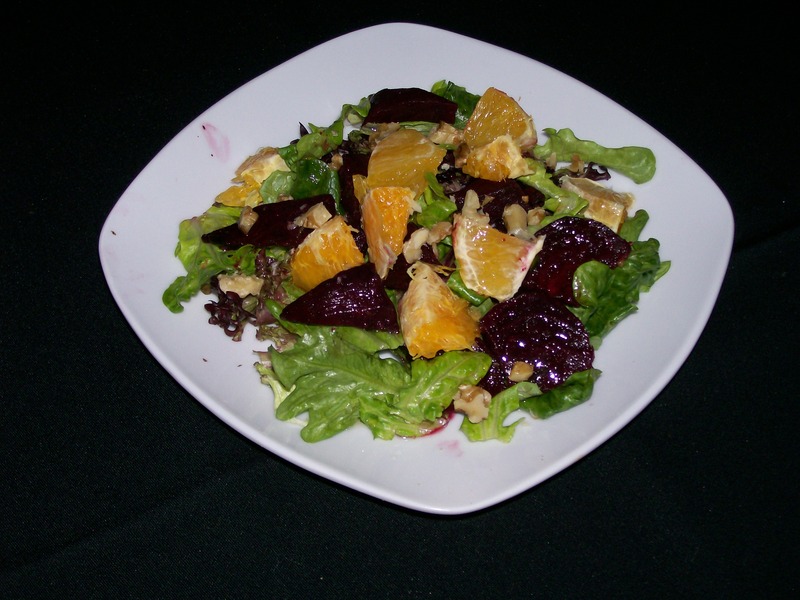 A way to use up bread going stale. Break or cut the bread up, pour a warm custardy mixture over it and bake till brown and fragrant. Served warm with a little cream poured over it, it became comfort food in a bowl. So why haven’t I made it in such a long time? Maybe because other more flashy desserts got my attention. What ever the reason I was reminded of bread pudding just recently when I was looking through a magazine in a waiting room (dentist appointment, Ugh). Coincidentally I had a large French baguette that I wanted to use. 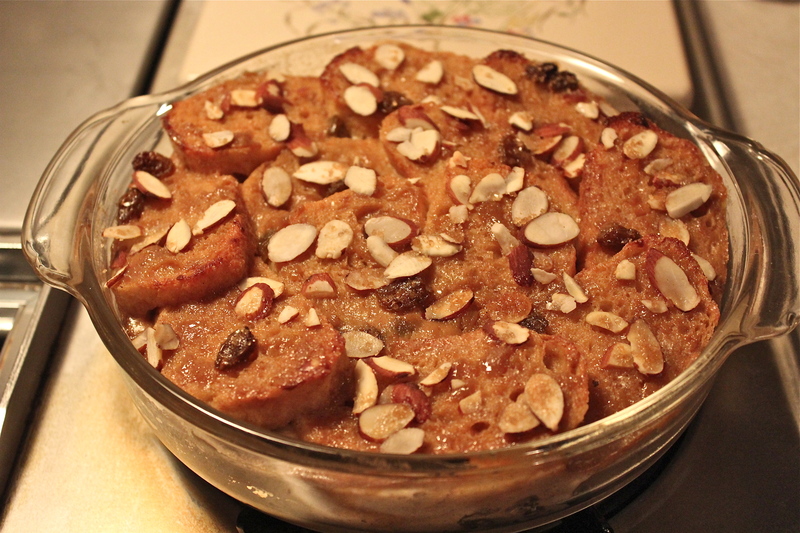 The light bulb went on and when I got home, I started in making this version of bread pudding. 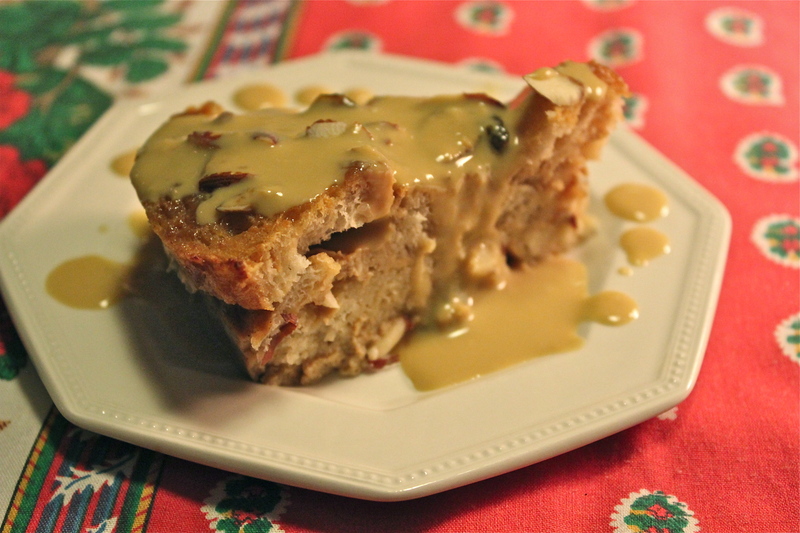 When my mother made bread pudding she often made a lemon sauce to pour over it, but I decided to make a sauce using some of the Irish Cream that I wrote about here. 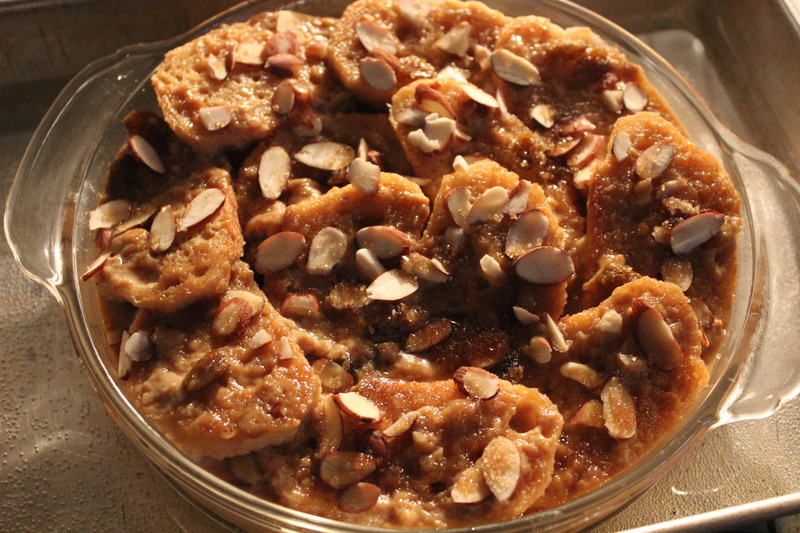 To make the sauce compatible with the pudding, I used some sliced almonds in the pudding along with some raisins, since there is almond flavoring in the Irish Cream. A match made in heaven, thank-you very much! Please note in the photos you see here, I made half the recipe by cutting all ingredients in half, except I used 3 eggs; and I baked mine in an 8-inch round cake pan, overlapping the top slices of bread for a “shingled” effect. 1. To prepare the pudding: Combine 2/3 cup sugar and eggs in a large bowl, stirring with a whisk. Heat 2 2/3 cups milk, vanilla, and cinnamon in a medium, heavy saucepan over medium heat until tiny bubbles form around edge–do not boil! 2. Gradually add hot milk mixture to egg mixture, stirring constantly with a whisk. Return milk mixture to pan; cook over low heat 6 minutes or until mixture coats the back of a spoon. Remove from heat. 3. Spray an 8-inch square pan with cooking spray. Cover bottom of pan with bread slices, fitting them close together. 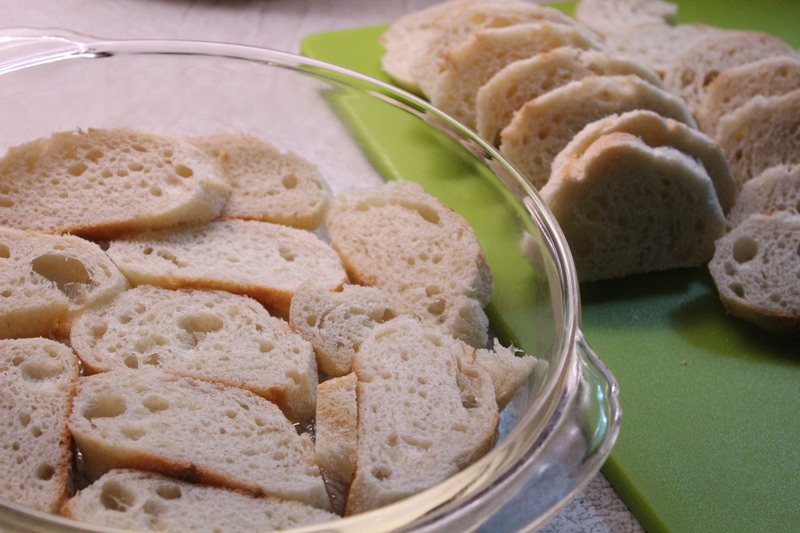 Fit bread slices snugly for a bottom layer. 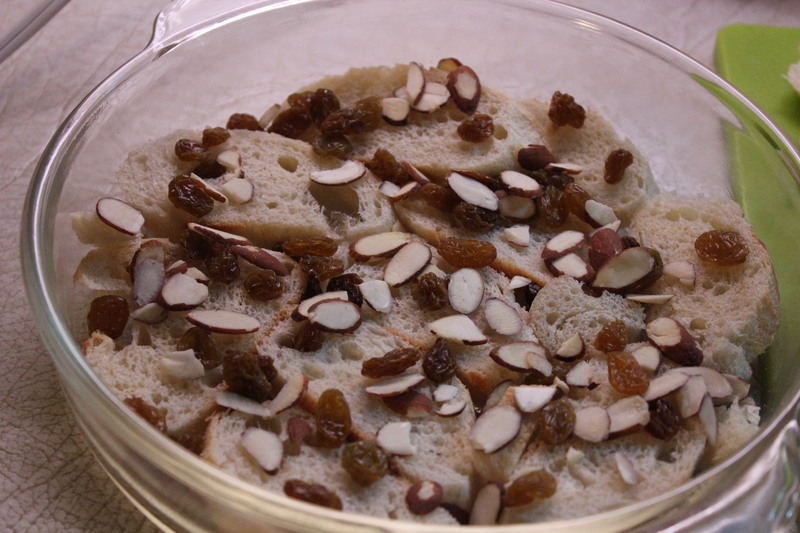 Sprinkle on half the raisins and half the sliced almonds. Repeat the layers again: as much bread as you can fit, raisins, and almonds. 4. Pour milk mixture over the bread and allow the bread to absorb some of the milk. Wait about an hour before baking. Before baking sprinkle top of pudding with the 2 Tablespoons raw sugar. repeat layers and pour egg-milk mixture over the top. 5. Preheat oven to 350*F. Place baking dish in a 13 x 9 inch baking pan; add hot water to pan to a depth of 1 inch. *** Bake, covered, at 350* for 20 minutes. Uncover and continue baking an additional 40 minutes or until a knife inserted in center comes out clean. 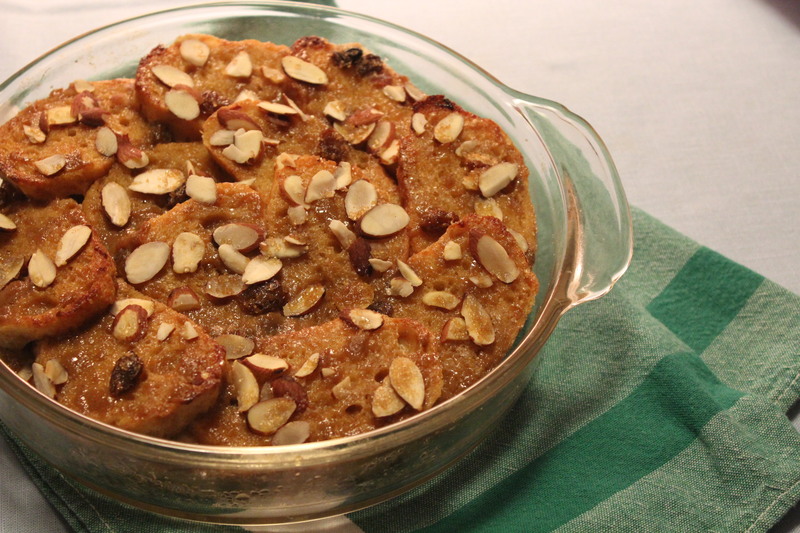 Bread Pudding, warm and custardy. ***Cooking the pudding in a water bath ensures creamy results. 6. To prepare the sauce: Combine 2 Tablespoons sugar and egg yolks in a medium bowl, stirring with a whisk. Heat 1/2 cup milk in a small, heavy saucepan over medium heat until tiny bubbles form around the edges—do not boil. 7. Gradually add hot milk to egg yolk mixture, stirring constantly with a whisk. Place milk mixture in pan; cook over low heat 6 minutes or until mixture coats back of a spoon. Remove from heat and stir in the liqueur. Allow sauce to cool to room temperature. This may be hastened by placing the pan in an ice-filled bowl and stirring constantly. 8. To serve, cut pudding into 9 squares, and serve with sauce over warm pudding.